Happy 126th Birthday, Paul Whiteman! Today marks the 126th birthday of orchestra leader Paul Whiteman. Known as the King of Jazz during his heyday, Whiteman isn’t afforded that level of respect by many in the jazz community today, but his influence is undeniable. His music may have leaned to the pop side a little bit, but in that era, jazz was dance music. It was pop, in a sense, and Whiteman helped to bring the new sounds to a wider audience. What’s more, the list of immortals who played or sang with Whiteman during his career is a lengthy one, among them Bing Crosby (who during his time with Whiteman was one of the hippest of vocalists), Bix Beiderbecke, Frankie Trumbauer, Joe Venuti, Eddie Lang, Jack Teagarden, Bunny Berigan, and Ramona Davies (she of the Grand Piano)—names that are very familiar to anyone who listens to Cladrite Radio reguarly. Whiteman also commissioned George Gershwin to write Rhapsody in Blue, and that influential work’s 1924 debut was performed by an expanded version of Whiteman’s orchestra, with Gershwin himself at the piano. Whiteman also performed in motion pictures, and it was announced earlier today that the restoration of his own starring vehicle, King of Jazz (1930), is now complete. It will be unveiled in screenings in various spots around the country beginning in May. 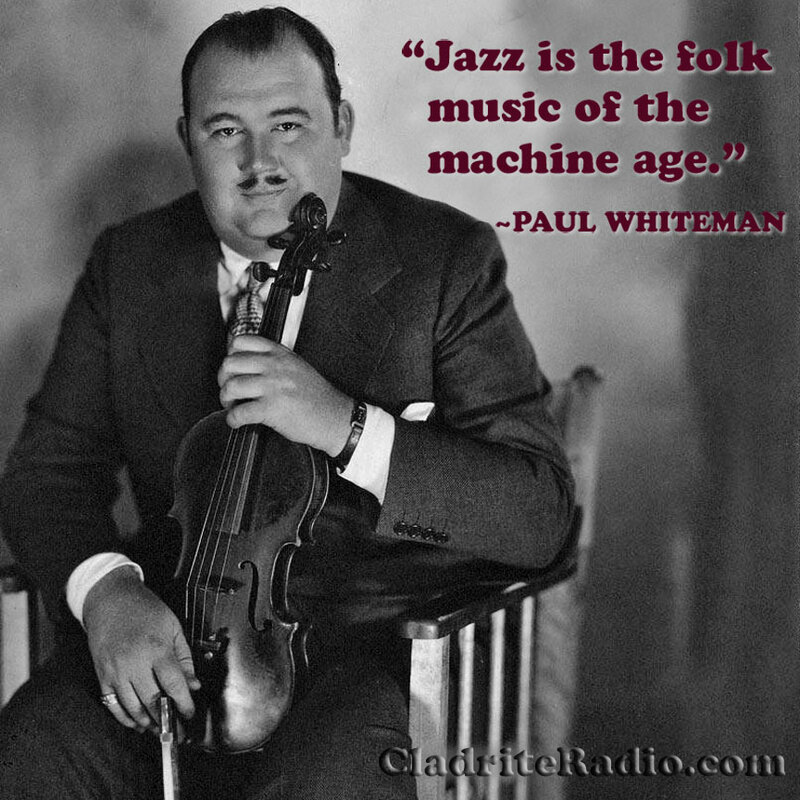 No less an authority than Duke Ellington once declared, “Paul Whiteman was known as the King of Jazz, and no one as yet has come near carrying that title with more certainty and dignity,” and that’s good enough for us. Happy birthday, Pops. We can’t wait to see a pristine new print of your movie in May!